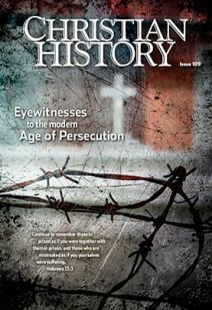 Eyewitnesses to modern persecution, Did you know? Polycarp, bishop of Smyrna, is one of the earliest martyrs about whom we have an eyewitness account. In the second century, his church in Smyrna fell under great persecution. When soldiers came to arrest him, Polycarp ordered food set before them and asked for an hour to pray. His prayer was so impressive that the soldiers questioned their orders. They allowed him not one but two hours before leading him back to town. There a magistrate ordered Polycarp to renounce Christ and give obedience to Caesar as Lord. Polycarp answered: “Eighty and six years have I served Christ, nor has He ever done me any harm. How, then, could I blaspheme my King who saved me?” In February 155 he died at the stake. Felicitas, a Christian slave arrested with her friends in the Roman persecution of 202 for refusing to sacrifice to pagan gods, was a catechumen preparing for baptism and in her eighth month of pregnancy. She feared her condition would require her to die alone for her faith later, because Roman law did not permit execution of pregnant women. But soon she went into early labor. As she groaned in pain, servants asked how she would endure martyrdom if she could hardly bear the pain of childbirth. She answered, “Now it is I who suffer. Then there will be another in me, who will suffer for me, because I am also about to suffer for him.” An unnamed Christian woman took in her newborn daughter. Felicitas and her companions were martyred together in the arena in March 202. In 524 scholar and politician Boethius lay on his bed, overwhelmed by gloom. Born to wealth, he slept on dirty straw. Once a consul in Rome, he was now the toy of cruel soldiers. The greatest mind of the age was in jail. Why? An orthodox Christian, he defended the doctrine of the Trinity, whereas his ruler, Theodoric the Ostrogoth, was an Arian. Boethius had stood against many corrupt office-holders in his career. They now slandered him to Theodoric, who jailed and tortured him. A frightened senate declared Boethius guilty. He was eventually killed in October 524. But on death row, Boethius imagined Philosophy entering his cell as a splendidly dressed lady, seating herself at the end of his bed and addressing him. Soon he was at work in his cell writing his greatest book, The Consolation of Philosophy, beloved for centuries. Thomas von Imbroek was a sixteenth-century printer at Cologne on the Rhine, an Anabaptist, and a man of peaceable, Christian spirit. His failure to baptize his children brought him to the attention of authorities in 1557. Months passed in which he was tortured and pressured to convert to Catholicism. To his persecutors he offered this speech: “I am willing and ready, both to live or to die. I do not care what happens to me. God will not let me down. . . . Sword, water, fire . . .cannot frighten me. . . . All the persecution in this world shall not be able to separate me from God.” He was beheaded in March 1558. Gorcum in the Netherlands, a town torn by war between Catholic Spaniards and Protestant Dutch, was seized by Dutch sailors known as the “Sea Beggars” in June 1572. They assaulted a citadel in which Catholic believers had holed up. Eventually they freed the laypeople, but subjected the priests to mock executions and ridicule, trying to get them to renounce the faith. In August 1643 missionary to Canada Isaac Jogues watched from a hiding place as Iroquois Indians captured fellow missionaries and Huron allies. Troubled by his safety, he realized he could not abandon them “without giving them the help which the Church of my God has entrusted to me.” He stepped forward and gave himself up. In captivity Jogues won the respect of the Iroquois. When freed he returned to France but was embarrassed by the praise lavished on him. Eventually he returned to Canada, where he was tomahawked during a negotiation turned violent. Before the Indian who killed Jogues was hung, he converted to Christianity and took “Isaac Jogues” as his baptismal name. Idi Amin seized power as Uganda’s president in 1971 and butchered 300,000 Christians. In January 1977 Anglican bishop Festo Kivengere challenged the killings in a sermon. Threatened with death, Kivengere fled with his family to neighboring Kenya, where he wrote the book I Love Idi Amin. These and other stories also appear on the Christian History website in our “Today in History” feature.